ASTPPC Ltd. 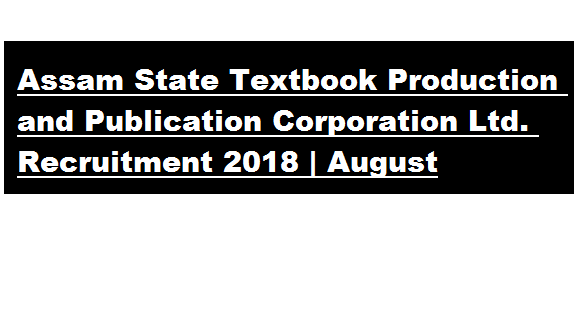 Recruitment 2018 August – Manager/ Internal Auditor/ Accountant/ Manager Production/ Manager Commercial/ Deputy Academic Officer Posts :- Assam State Textbook Production and Publication Corporation Limited has issued a recruitment notification in the month of August 2018. Applications are invited from Indian citizens for filling the following vacant posts in Assam State Textbook Production and Publication Corporation Limited (a Govt. of Assam undertaking), Guwahati. In this section, we will discuss in detail about Recruitment of various posts under Assam State Textbook Production and Publication Corporation Ltd. Recruitment 2018 with all the details and requirement. Educational Qualification: Candidates must be Commerce Graduate. Preferably Major in Accountancy. Educational Qualification: Candidates must have Degree in printing technology from Govt. recognized University/ institution. Educational Qualification: Candidates must have Degree/Diploma in printing technology from Govt. recognized University/ institution. Educational Qualification: Candidates must be M.A. in one of the subjects like History, Geography, Pol. Sc. etc. or M.Sc. in any of the subject like Physics, Chemistry, Math etc. Diploma in Computer Application. Application Fee: Applicants who belongs to the general category will have to make payment of Rs. 500/- online for each post they are willing to apply. Applicants who belongs to the other reserved category will have to make payment of Rs. 250/- online for each post they are willing to apply. Eligible Interested applicant may submit their application online alongwith C.V. photograph and two references to the website http://www.astppconline.in with effect from 10:00 A.M. 14/08/2018 to 4:00 P.M. 31/08/2018.